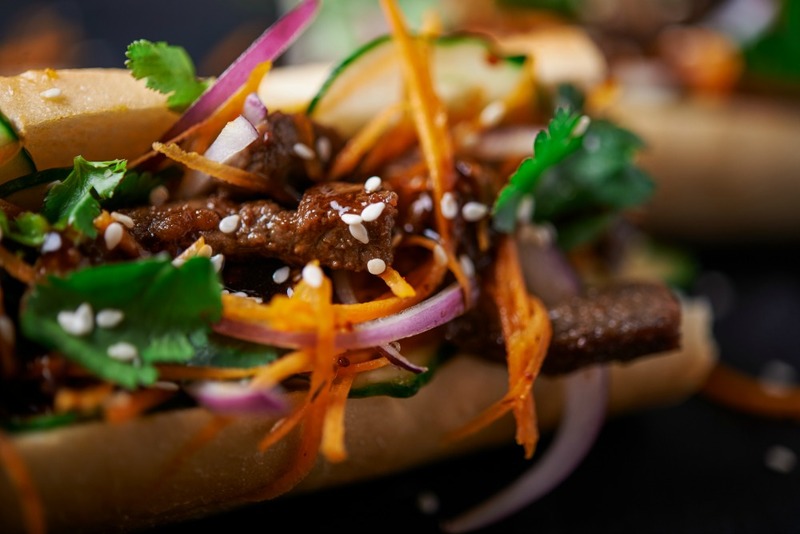 Nothing gets us frothing quite like fusion food, and Banh Mi’s are one of our favourites. Soft baguettes, crunchy pickled veg, spicy chili and melt in your mouth pork – it’s the perfect blend of French and Vietnamese, and we’ll happily smash one down any time of day. We’ve found the best of the best around Brisbane, just keep it to yourselves. Vegetarians and vegans rejoice! Local legends Café O-Mai have us saying ohhhhh my to their veg friendly Vietnamese baguettes. Stuffed with soy and lemongrass marinated tofu, radish, carrot, cucumber, coriander and vegan mayo – no one has to miss out. You’re not going to get table service or mineral water from Minh Tan Bakery, but you are going to get VERY cheap, VERY tasty banh mi. Choose from three kinds of pork, chicken or all of the above if you’re feeling extra – it’s worth the trek to Inala. West End institution, cure of hangovers and giver of life – Kim Thanh is as West End as Musgrave Park. Hot and fresh from the bakery kitchen, their baguettes are baked on site and their filling is on point. Whether traditional BBQ pork is your bag or you’re more interested in mixing things up with meatballs in homemade tomato sauce, this north side Vietnamese café is one of our favourites. With a considerable Vietnamese population it’s no wonder that Darra has some of our favourite Vietnamese haunts. If you’re looking to get some pork on your fork, Scotts Road Deli is your dream come true with everything from classic pork rolls, to roast pork and gravy. Proving that you don’t always have to travel to the outer suburbs to get bang on banh mi, this little café is serving up some seriously tasty baguettes. From vegetarian to traditional pork they are killing it. Best of all? Buy a banh mi and get a cheeky coffee for just an extra $2. Bar-gainnnn.